So often this happens in life: you go to see one place or thing, and what ends up being the special highlight is not at all the object of your visit. Fate intervenes! This happened to me again when I went to see the famed cathedral of Saint-Bertrand de Comminges in the French Pyrenees. Yes, the great structure, first raised in 1073 near the site of a Roman city Lugdunum Convenarum, is impressive. It soon changed from its Romanesque beginnings to being a far more elaborate Gothic pilgrimage centre in the late 13th century,, adopting the name of its famed bishop, Bertrand de Got, Bishop of Comminges. Its interior is dominated by an amazing choir and sixty-six stalls, a marvel of carved portraits and scenes in oak, all designed so that the pilgrims visiting St. Bertrand's tomb would not interfere with the daily offices of the canons attached to the cathedral. But another delight awaited me after I explored the cathedral and surrounding small hill town. A short distance away, below the Roman ruins and St. Bertrand de Comminges itself is the hamlet of Valcabrère. Down a small plane tree-lined road through the fields lies a gem - Saint-Just de Valcabrère. A small Romanesque church, dominated by a sturdy but perfectly proportioned square bell tower crowned with a pyramid tiled roof, it is intimately linked to its cemetery by the simple portal through which one enters the 11th century church. Golden stone, perfect Romanesque arches, a sense of quiet and peace, simplicity everywhere - I was mesmerised. I have always loved Romanesque architecture and have often meandered through France to visit churches of this era, but Saint-Just de Valcabrère is one of the loveliest examples I have seen. The entrance is so restrained in the carved details, St. Etienne who was martyred in Alcala de Henares, Spain, on 6th August, 304 AD, during the terrible persecutions imposed by Diocletian. 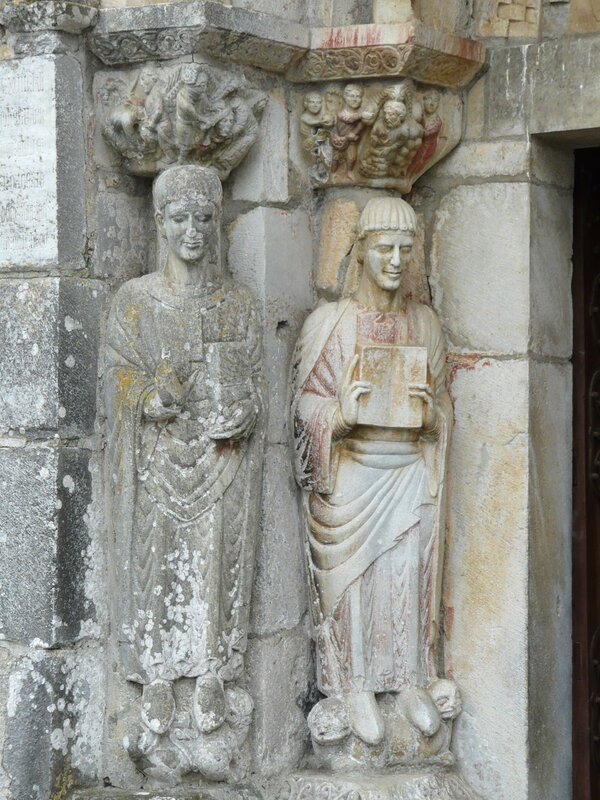 He is accompanied by two Spanish martyred priests in the outer carvings. I was strangely lucky in the timing of my finding Saint-Just: as I arrived, I found all the little roads approaching the church jammed with cars and people walking to the entrance. The bell began slowly to toll - so I knew it had to be for a funeral. I joined the mourners and entered the totally packed church just as the priest was beginning the service. Again, perfectly proportioned golden arches, a sense of intimacy and timelessness, despite all the people. The altar in white marble is perhaps the most elaborate aspect of the interior, but it seemed totally appropriate. At the far end of the church from the altar, where normally one enters a church, there is an imposing organ, played beautifully when I was there. I did not linger too long as people were still arriving and every chair in the church was required. So I slipped away, amazed and grateful at my wonderful magical moments. It is not every day that one happens on such elegant, beautiful simplicity.